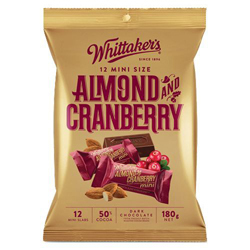 Whittaker’s rich dark chocolate, delicious cranberries and generously crunchy almonds. Experience the cacophony of flavours locked in this bite sized chocolate! Dark Chocolate (Cocoa Solids 50% (Cocoa Mass, Cocoa Butter), Sugar, Emulsifier (Soy Lecithin), Vanilla Flavour), Cranberry Pieces 14% (Cranberries 51%, Sugar, Sunflower Oil), Roasted Almonds 6%.